“The premise of this book has been that the Christian imagination must be free to sing a new song before the world can hear our music. This requires a process of deconstruction and reconstruction. 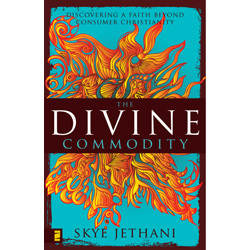 Deconstructing our commodified view of God, and reconstructing a sense of wonder through silence. Deconstructing our branded identities, and reconstructing identities rooted in faith through love. Deconstructing our attempts at transformation through external events, and reconstructing internal transformation through prayer. Deconstructing our devotion to institutions as God’s vessels, and reconstructing relationships with our brothers and sisters in Christ. Deconstructing our unceasing pursuit of pleasure, and reconstructing the redemptive power of suffering through fasting. Deconstructing our contentment with segregation, and reconstructing the unity of all people through the cross. I really believe that our culture is bleeding over into our church buildings. Christians don’t appear to be much different than the world. (common example – divorce rates). I think that it is time for a change. We are ripe for the next reformation. I wonder who the next Martin Luther is? I predict he is already on the landscape. I think we will move backward this time. More to the roots. God uses “family” descriptors for the Church. We are all brothers and sisters in Christ! Four walled institutions are not the Church. They are part of the Church, but as they grow they tend to become more corporate and less family. I’m not sure what the reformation will be, but I hope we are heading back toward family! Check out this book and let me know what you think!